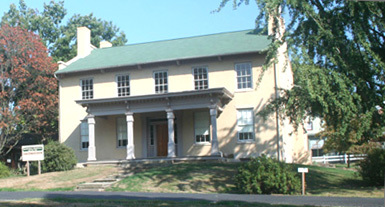 Constructed between 1815 and 1817 by War of 1812 General Reasin Beall, the house is the oldest surviving residential structure in Wooster. The house once used by the College of Wooster as a dormitory, is gradually undergoing a transition from the Society’s main museum building to an authentic recreation of how it looked during the 19th century. The Society restored this magnificent structure to its appearance when General Beall and his descendants lived there. The restored Beall-Stibbs Homestead reopened to the public in 2008. Reasin Beall was born in Montgomery County, Maryland, December 3, 1769, and enlisted in the military in 1790. By 1793, he had been appointed battalion quartermaster under famed Revolutionary War hero General “Mad” Anthony Wayne. In 1812, Beall was commissioned brigadier general of Ohio Volunteers. From April 20, 1813, until June 7, 1814, Beall served in the Thirteenth United States Congress while filling a vacancy caused by the death of Representative John S. Edwards. Upon his resignation, Beall moved to Wooster where he served as register of the land offices at Wooster and Canton. Remaining politically active, Beall lived the last twenty-eight years of his life in Wooster until his demise on February 20, 1843.